Looking for a fall or Halloween appetizer? 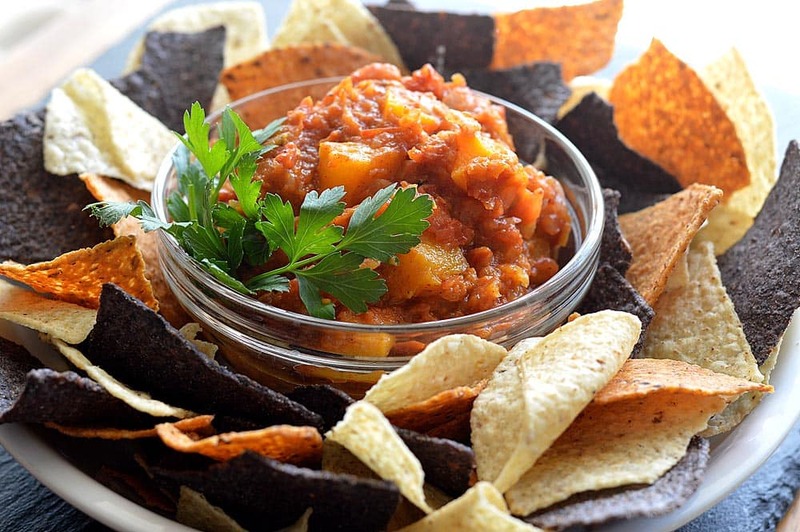 Well I’ve got you covered with this Chunky Chipotle Pumpkin Salsa. 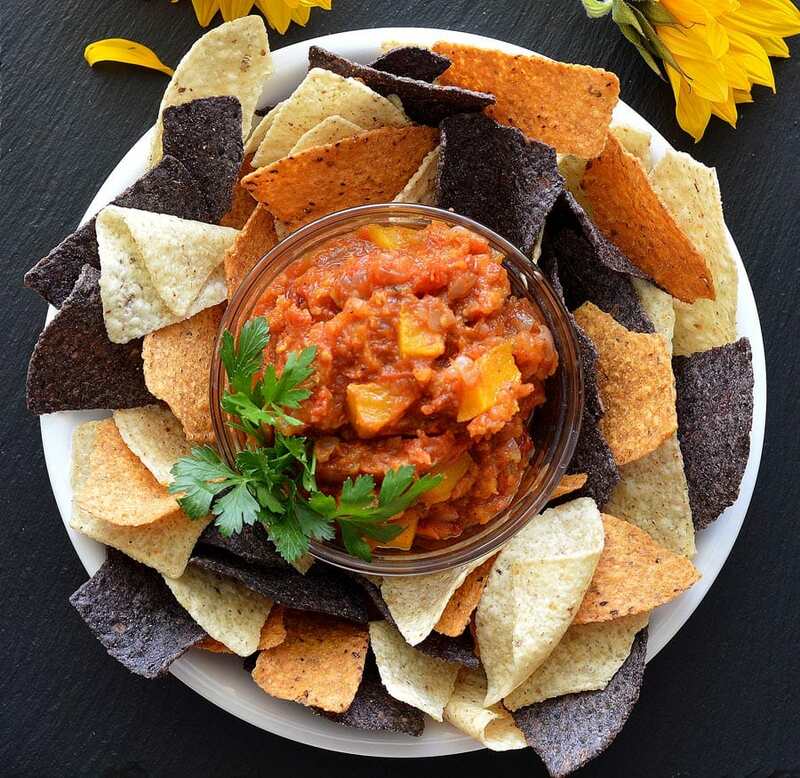 Served with tri-color tortilla chips, this salsa is both sweet and savory with just a bit of spice. This was one of those recipes that sounded good in my head, but I wondered how would it translate? I absolutely loved it and thought the levels of flavor were on point! 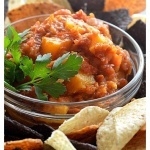 This salsa is best served warm or at room temperature. I began by roasting whole tomatoes, onions and garlic until tender with charred edges. These will be roughly pureed and become the base of the salsa. I also roasted diced pumpkin (or butternut squash if you can’t find baking pumpkins). These are reserved to fold in at the end. We’ll also be using canned pumpkin for this recipe. Be sure it’s pure pumpkin puree and not pumpkin pie filling. Two entirely different products. For the tomatillo and chipotle chile, I opted to use the canned version. The work is already done and these are both easily found in the Mexican aisle of your local grocery store. To round out the flavors, I added a bit of sugar and my pumpkin pie spice. You can find my homemade recipe here. After a few quick pulses in the food processor, I fold in the roasted pumpkin cubes. If needed, you can warm up the whole mixture or better yet, keep it warm for your guests. If you are wondering about those tortilla chips, I actually found them at Walgreens (of all places). They are a mix of white corn, blue corn and chipotle chile flavored tortillas. On one sheet pan, place the diced pumpkin (or butternut squash if you can't find it). On the other pan, place the onion and tomatoes. Toss with a small amount of oil and season all with salt and pepper. Cut the top off of one small whole head of garlic. Drizzle with oil and season with salt and pepper. Wrap in aluminum foil and place on the sheet pan with the tomatoes. Roast until tender and golden. Allow the roasted veggies to cool for just a few minutes, setting the squash cubes aside for later. Place the tomatoes and onions into a food processor. Unwrap the garlic and squeeze the cloves into the processor, discarding the outer garlic paper. You can use as much or as little as you'd like. Add the pumpkin puree, sugar, pie spice. Pulse just a few times before adding the chipotle and tomatillo. I don't measure these two. It's all by taste, so start off slow. You can always add but you can't take away. Lastly, fold in the reserved squash cubes. This sounds so good!! Can you can this recipe? How long would you put it in a water bath?